A couple of moons ago I stumbled across an algorithmic puzzle which I want to share. It is not too simple s.t. an efficient solution can easily be seen but also not too complicated s.t. it is beyond hope of finding a solution in polynomial time – at least not yet or not for me. So my effort in describing this problem can also be considered as a crowd sourcing attempt in finding a solution and I call you for contribution. The problem is an idealization of a real algorithmic problem I was dealing with but I stripped off some additional complications in order to improve it as a game play. Let’s go in medias res quickly. The basic setup is that of a directed acyclic graph which is layered or stratified as depicted in the diagram below. If we enumerate the stripes in ascending order, a vertex of stripe i can be connected with one or more vertices in stripe i+1. There is a single vertex in the bottom stripe and the top stripe. Each path from the bottom vertex to the top vertex has the same length and each move upwards is as good as any other. In the number list [-1, -2, 2, 1] we can first remove -2 and 2 and get [-1, 1] which can be further reduced to . The number list [-1, -1, 2, -2] can be reduced to [-1, -1] but not any further. 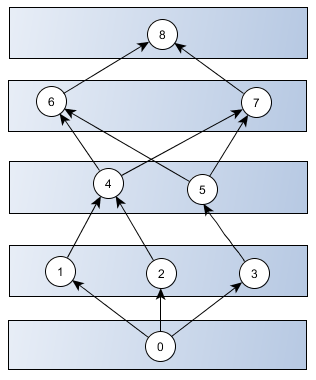 if there is a sequence of reductions of the number list L1 yielding L2 and say that a complete path Pt(V, V[N]) connecting the bottom with the top of the kite is valid iff Pt(V, V[N]).numlist => . The number list of a valid path can be reduced to the empty list. Assume that K is fixed and let the number N>=2 of kite vertices be variable. So we consider the set of all kites which are constrained by N vertices and this for arbitrary numbers N>=2. Is there an algorithm which can determine a valid path ( or detect its absence ) which is polynomial in N?